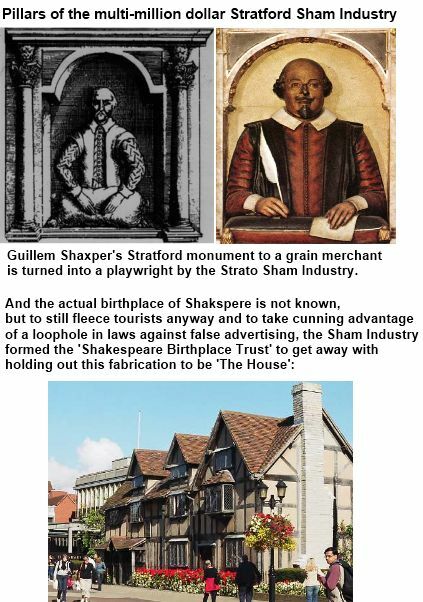 And guess who is the Chairman of The Shakespeare Birthplace Trust and in effect the Stratford Sham industry, none other the No. 1 elistist academe snob himself, Professor Stanley Wells. Yep, he’s not affected by any recession, with his lifetime employment and book contracts with dinosaurs. He’s got it down pat, in the way he trots out the same old flimsy case for Guillem Shaksper, but just forgets to mention there is no documentary evidence that he attended any grammar school, or could even write, there are no manuscripts or letters, and his typical businessman Will mentions no Plays or Sonnets. And nobody knows his actual birthplace. That’s not The House, it all a lie. Yes indeed, the spear-shaped ‘pen is mightier than the sword’ or in modern times the pen becomes an iPad keyboard thus now ‘The Internet is mightier than the Establishment’. If your child attends Wells’ institution it’s time for action against such snobbery, let him get up in front of parents and declare again that he really believes the Stratford guy is not a frontman. Then demand Prime Minister David Cameron really research the origins of ‘Hacking‘ and fire him, and put an end to the Shakespeare BirthPlace Trust for false advertising to ripped-off Tourists. It’s fine if the Stratos want to use their 400 years of entrenchment in concrete bunkers. We can keep teaching our children the “Stratford Sham Industry”. And there really is a tooth ferry and pigs do fly. At least there is the same amount of evidence. And Strato Simon Schama (does anyone look and sound more a paragon of snob elitist academia?) has called the heresy an “idiotic misunderstanding of history”. Scientists are always prepared to reconsider longheld notions of the way things work with evidence that the little neutrino could be faster than light. In stark contrast can you imagine this current batch of Stratos having a close look at The Evolution of the English Sonnet. One of the absolute pillars of science – that nothing can go faster than the speed of light – appears to have been upended by a subatomic particle in an experiment in Switzerland. Scientists at the world’s largest physics lab outside Geneva said today they have clocked neutrinos travelling faster than light. That’s something that according to Albert Einstein’s 1905 special theory of relativity – the famous E=MC² equation – just doesn’t happen… it would force a fundamental rethink of the laws of nature.